If you’re planning a visit to Belize, the country’s famous jungles are bound to be on your to-do list. Here are a few of our favorite spots to visit – and how best to see them. The extraordinary Monkey River is a popular eco-tourism destination. Visitors can take trips up the river, spot native wildlife and learn about local culture and customs. Expect to spot the howler monkeys that give the river its name, along with manatees, crocodiles, toucans and parrots. Adventurous travelers can also go cave tubing or ziplining. It’s a definite favorite with the owners of Sirenian Bay! The only jaguar preserve in the world, Cockscomb Basin is rich with rare and wonderful wildlife. Walking trails wind their way through waterfalls and mountain peaks, making for a picturesque experience. In addition to jaguars, you’ll also spot other large cats, deer and tapirs, along with plenty of vibrantly colored birds. Ten miles west of San Ignacio Town, the Belize Botanical Gardens span 45 acres of lush plant life. An orchid house, a huge palm collection, and an enormous collection of tropical fruit trees are just some of the attractions. Visitors can try the numerous hiking trails – with a guide or not – or enroll in a class on plant identification, composting or eco-friendly gardening. Not far from the gardens, the Actun Tunichil Muknal (ATM) cave is a renowned sacred cave home to the partial skeletal remains of some 14 Mayans. To get there, you’ll have to hike through lush jungle, then wade up a subterranean river. Once inside, you’ll find stalagmites, stalactites and a wealth of ancient vessels and artifacts. Expect to spend about a day visiting the site. Keeping with the cave theme, Actun Loch Tunich is a must for those who thrive on adrenaline. To get to the cave, you’ll hike up the Maya Mountain foothills until you reach an enormous sink hole overlooking a stunning rainforest canopy. It’s not for the faint-hearted, however: to get back out you’ll have to climb! A trip to the Lamanai ruins involves a spectacular riverboat journey through the jungle rich with native wildlife, including spider monkeys and tropical birds. Once there, you’ll get to explore a variety of excavated buildings and temples including the Jaguar Temple, the High Temple and the Mask Temple, all of them surrounded by lush jungle. At one point home to 20,000 people, Lamanai is an ancient jungle city like no other. Want to ensure that you’ve covered all the best jungle tour options for your Belize trip? 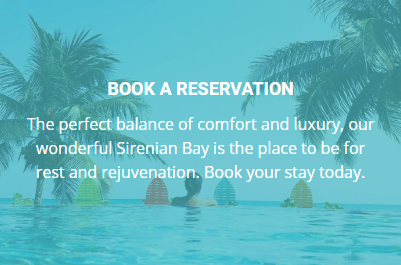 The team at Placencia’s Sirenian Bay Resort & Villas is happy to help – just get in touch.